Artistic expressions from the world's oldest continuing culture are drawn from all regions of the country in the Gallery's holdings of Indigenous Australian artworks, with a focus the on rich diversity of Aboriginal and Torres Strait Islander cultures and experiences in Queensland. The Indigenous Australian Art collection has a focus on contemporary art, including paintings, sculpture, printmaking, photography, video and installation. It includes the most significant collection of contemporary Indigenous Australian fibre art from across the country, with objects made from natural and introduced materials, related sculptural objects and paintings and prints which reference fibre and reflect major themes and stories. 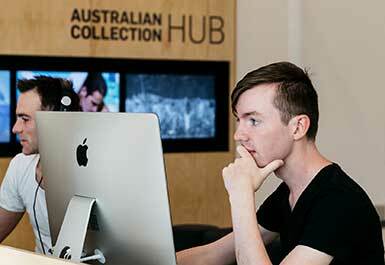 See the collection display, Indigenous Australian Collection: Namatjira Story at QAG. This display features early works by Albert Namatjira alongside artworks by those he influenced, including artists from the Arrernte landscape painting tradition, the Hermannsburg Potters and his great-grandson, Vincent Namatjira. 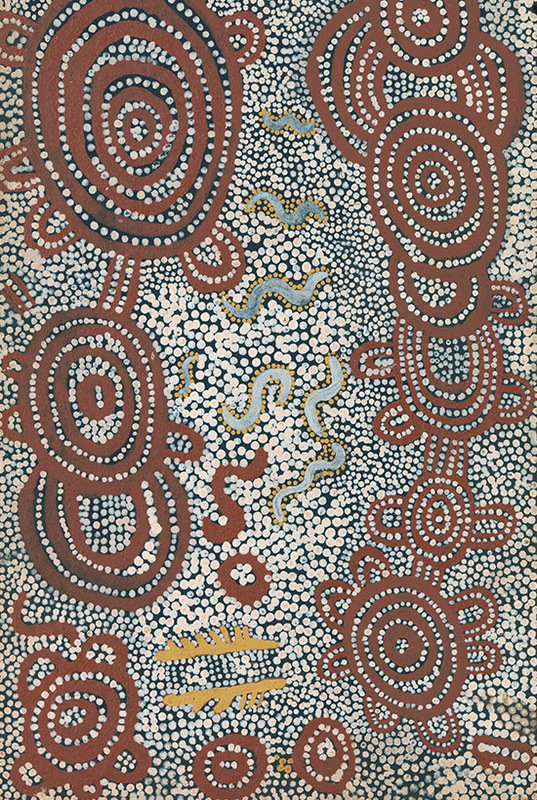 Yumpululu Tjungarrayi, Australia b.c.1925 / Yinma - A gathering of people for ceremonial purposes 1973 / Synthetic polymer paint on composition board / Purchased 1995 with a special allocation from the Queensland Government. Celebrating the Queensland Art Gallery's Centenary 1895-1995 / Collection: Queensland Art Gallery / © The artist. 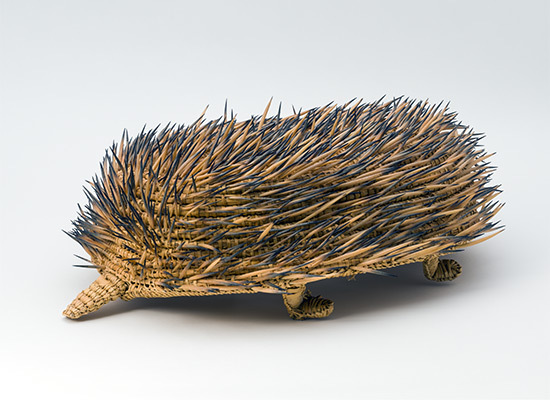 Yvonne Koolmatrie, Australia b.1944 / Echidna 1992 / Sedge rushes and echidna quills / Purchased 1995. Queensland Art Gallery Foundation / Collection: Queensland Art Gallery / © The artist. 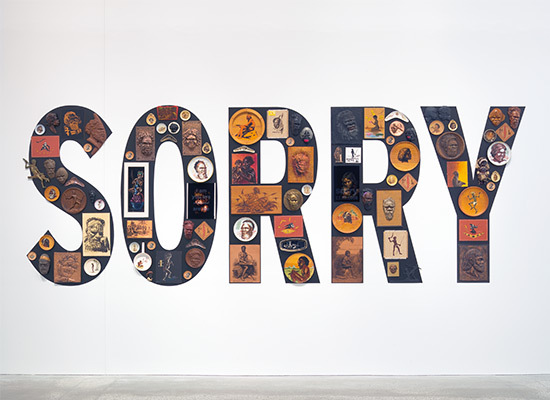 Tony Albert, Australia b.1981, Girramay people / Sorry 2008 / Found kitsch objects applied to vinyl letters / The James C Sourris Collection. 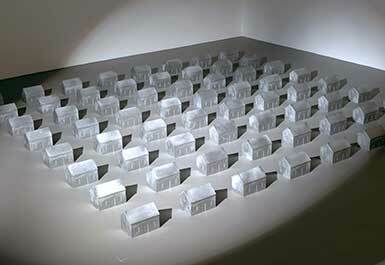 Purchased 2008 with funds from James C Sourris through the Queensland Art Gallery Foundation / Collection: Queensland Art Gallery / © The artist. At the time of European arrival, Australia was home to the visual traditions of over 250 different Indigenous peoples. Queensland's varied geography fostered a great diversity of cultural material. The Gallery is committed to developing its holdings of early Indigenous Australian art and objects to better represent the many visual traditions of Indigenous Australia and to present the art histories of Queensland's Indigenous communities in all their rich variety. The earliest painting in the Indigenous Australian art collection is Corroboree by William Barak, the Wurundjeri artist and social activist from Victoria, which dates from the 1880s. The Gallery's first acquisition of an Indigenous Australian artist's work, in 1947, was the watercolour Western MacDonnells c.1945 by Western Arrernte artist Albert Namatjira. East Cape York artist Joe Rootsey is well-represented with his unique watercolours of north Queensland and south-east Queensland from the 1950s and 1960s, and a selection of 1960s bark paintings from Hopevale enriches holdings from this period. A significant group of bark paintings, including works from the 1948 American Australian Scientific Expedition to Arnhem Land, include a monumental collaborative work, Yalangbara c.1960, by eight senior ceremonial leaders and artists from north-east Arnhem Land; and a group from Wadeye (Port Keats) in remote Northern Territory, produced in the 1950s and 1960s. These include Nym Banduk's significant Ngakumarl painting (Murrinhpatha totemic landscape) c.1959–60. A substantial collection of works from northern Queensland was developed in the wake of the 2003 exhibition 'Story Place: Indigenous Art of Cape York and the Rainforest'. These include a significant group of sculptures from Aurukun, ceramics by senior artist Thanakupi, ceramics and fibre works from Yarrabah, near Cairns, Girringun (Cardwell and Murray Upper), Mossman and Lockhart River, and an imposing group of rainforest shields and swords. The Gallery holds significant paintings by artists including Rosella Namok, Samantha Hobson, Lisa Michl, Roy McIvor, Doris Platt, Fiona Omeenyo and the late Arthur Pambegan Jnr. 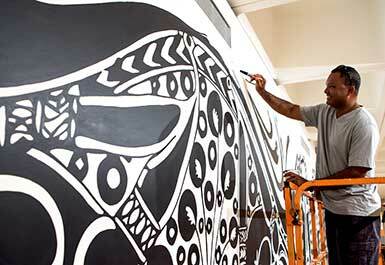 Queensland urban-based Indigenous artists are leaders of contemporary art practice in Australia and are widely represented overseas. Vernon Ah Kee, Richard Bell, Gordon Hookey, Fiona Foley, Archie Moore, Judy Watson, Tony Albert and the late Vincent Serico offer distinctive political and social perspectives in their works. Other works by contemporary urban-based Indigenous artists include photography, video and film by Brook Andrew, Christian Thompson, and Genevieve Grieves, with photographic suites by Destiny Deacon, Michael Riley and Ricky Maynard. Uniquely in Australia, Queensland is home to two Indigenous cultures: the Aboriginal and Torres Strait Islander peoples. The Gallery holds the most substantial collection in the world of the contemporary art of the Torres Strait Islands, which is primarily prints and sculptures used in performance. As part of the Gallery's 2011 exhibition 'Land, Sea and Sky: Contemporary Art of the Torres Strait Islands' – the largest of contemporary Torres Strait Islander art to date – a number of important works were commissioned and acquired. These included printed silk textiles by Rosie Barkus, watercolours by Segar Passi, a reverential printed floating ceiling by Brian Robinson, charcoal drawings by the Erub Erwer Meta artists and large groups of ghost net weavings and zamiyakal (dance machines) by Yessie Mosby, Billy Kris and Patrick Thaiday. Other works in the Collectoin include innovative dance sculptures by senior artist Ken Thaiday and a suite of 13 feathered dhoeri (headdresses) by George Nona. The Gallery's Central, Western and Eastern desert collection encompasses the whole period of the production of portable art in that region. Early Papunya boards — including paintings by Mick Namarari Tjapaltjarri, Kaapa Mbitjana Tjampitjinpa, Yumpululu Tjungarrayi, Shorty Lungkarda Tjungarray and Johnny Warrangkula Tjupurrula— chart this major art movement from its inception, while large-scale masterpieces from the 1980s by senior artists such as Uta Uta Tjangala demonstrate the political momentum of the Pintupi push to establish homelands in their own country at Kintore and Kiwirrkurra. Major recent paintings by celebrated artists George Tjungurrayi, Walangkura Napanangka and the late Doreen Reid Nakamarra illustrate the continued relevance and innovation in art from this area. Works by artists from Utopia, including the eminent Emily Kame Kngwarreye, Minnie Pwerle and Angelina Ngal, provide a perspective from the eastern side of the centre. Works by artists from the Anangu painting centres, especially a magnificent group of seven collaborative paintings by women artists from Amata and others from the Pilbara region in Western Australia trace the continuance of this indefatigable contemporary art movement. From the late 1930s to the present day, the Hermannsburg School of watercolour landscape painting is among the longest continuing Indigenous Australian art movements, as well as one of the most important. A painting by Albert Namatjira was the Gallery's first acquisition of an Indigenous artist's work, and an important gift of 30 Hermannsburg paintings in 1979 strengthened the collection. More recent acquisitions of acrylic paintings and pottery from the Hermannsburg Potters and watercolour landscapes by the descendants of Namatjira and other Hermannsburg school artists demonstrate the significance of the movement's legacy. 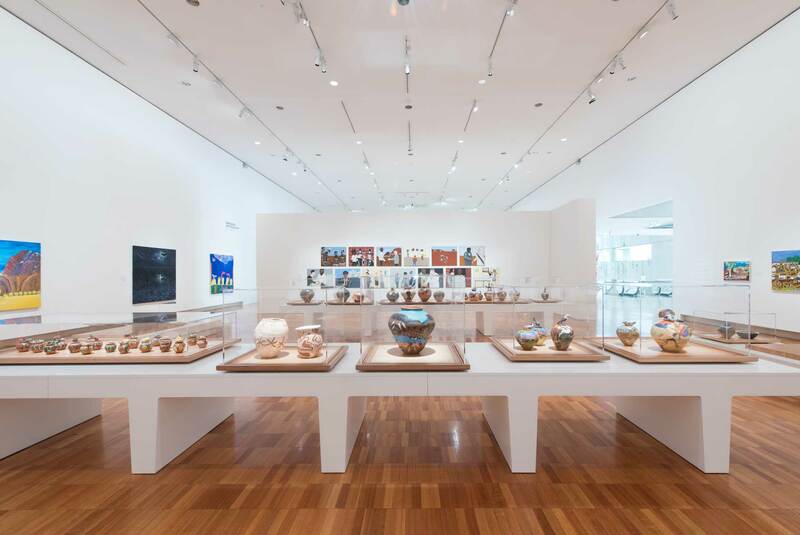 This collection was showcased in the Gallery's regional touring exhibition 'Namatjira to Now' in 2009, which included vibrant contemporary ceramics and acrylic paintings by Hermannsburg women alongside contemporary watercolours. Art from northern Australia in the Collection includes monumental hollow log burial poles, a major group of Banumbirr (Morning Star poles) and many ornamental feathered objects from Galiwinku. Paintings by leading artists from the Yirrkala community in the Buwayak (invisibility) style are a focus, including a group of bark paintings and larrakidj memorial poles by the politically important figure Djambawa Marrawili, included in 'The 5th Asia Pacific Triennial of Contemporary Art' in 2006. Works by Gunybi Ganambarr, an emerging younger generation artist, signal exciting new developments in Arnhem Land art. There are paintings and fibre work from senior female artists from Peppimenarti and a group of works by leading Tiwi artists, including paintings, prints, pukamani poles (tutini) and tunga (bark baskets). Paintings by Rover Thomas, Queenie McKenzie, Mabel Juli, George Wallaby and Hector Jandany, as well as a Wandjina painting by senior artist Lily Karadada, underpin the Kimberley collection. A full set of balmarra, monumental coloured wool performance sculptures by Alan Griffiths, dance frames by Roy Wiggan, riji (pearl shell pendants) by Aubrey Tigan, and paintings by Fitzroy Crossing artists Butcher Cherel, Dolly Snell and the final works by the late Wakartu Cory Surprise, make the Kimberley and north-western representation a diverse and exciting aspect of the Collection. Since 2003, the Gallery has built on earlier holdings of silk batik textiles from various central Australian art centres with the acquisition of over 300 Aboriginal fibre works, creating a special focus in the Collection. Groups of works by leading fibre artists Yvonne Koolmatrie, Shirley Macnamara, Lena Yarinkura and Judy Baypungala give prominence to these artists in a genre that has only recently gained due recognition. These were showcased in the 2009 exhibition 'Floating Life: Contemporary Aboriginal Fibre Art'. Woven pieces made from natural and synthetic materials are joined in this area by objects, paintings and prints that reference fibre. Arnhem Land artists have provided many beautiful works; however, urban-based artists breaking new ground, such as Lorraine Connelly-Northey and Jonathan Jones, have extended the Collection in exciting directions.